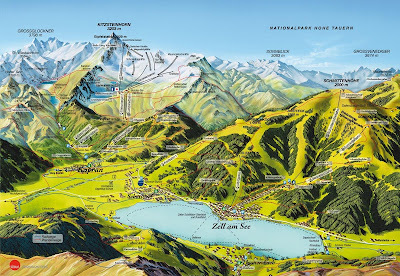 There are a number of sites on the internet where detailed maps can be found showing the area in and around Kaprun and Zell am See. A quick overview is the lake in the foreground is the lake at Zell am See, highly recommended is the 7 mile walk around at around 2 hours or so of steady flattish walking. To the topside of the lake is the town of Zell am See which was founded by monks upon the the instruction of the Archbishop of Salzburg. 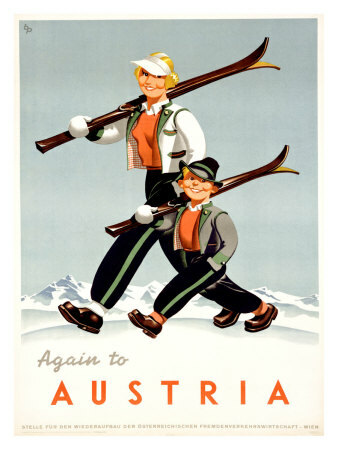 It is a lovely traditional Austrian market town, the Grand hotel sits at the end of the peninsula, and the hot chocolate is very reasonably priced. There is a bypass road through the mountain to the rear of the town in a tunnel about 3 miles long! Above the town is the Schmitten famous for its chapel dedicated to the Empress Elizabeth, from the top 30 or so peaks rising above 2000 metres can be seen on a clear day. 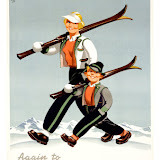 There is a regular lift service up from the town throughout the year. To the south ( left) of the town of Zell am See is the Schuttdorf, shops galore, with some large supermarkets in this area, but also the Schuttdorf lift. In the valley further to the south is the aerodome / flugplatz, further up the valley is the Zell am See / Kaprun 36 hole championship golf course. Crossing the valley moving towards Kaprun is the site of the Spa-world-Kaprun which is due to open late in 2010. Looking across the valley at the side of Kaprun is Kaprun burg /castle (one of a number of castles in the valley). Kaprun is a typical Austrian village started as a farming village and now primarily based on the tourist industry for its living. Further South from the village is the Maisikogel lift which shoots you up the mountain to an altitude of 1675 metres, from there a stunning walk along the ridge takes you towards the Kitzsteinhorn glacier, from the top of the mountain, and over the other side of the slope is the Kaprun reservoir complex which is open in the summer months and well worth a visit. There are many other attractions in and around the area, and the above is just a brief summary. If you are looking for somewhere to stay please consider www.austria-holiday-apartment.com it sleeps upto 9 in comfort with the benefit of 3 bathrooms and 3 bedrooms. Come and discover the area for yourselves?